[UK] National Institute for Health and Clinical Excellence, 2015. Online flowcharts from the UK National Institute for Health and Clinical Excellence guide planners and practitioners dealing with alcohol use disorders through choices of strategies and interventions on prevention, brief interventions, alcohol treatment, and treatment of associated medical conditions. Summary Clinical and public health pathways published by the UK National Institute for Health and Clinical Excellence (NICE) bring together all NICE guidance, quality standards and materials to support implementation on a specific topic area. 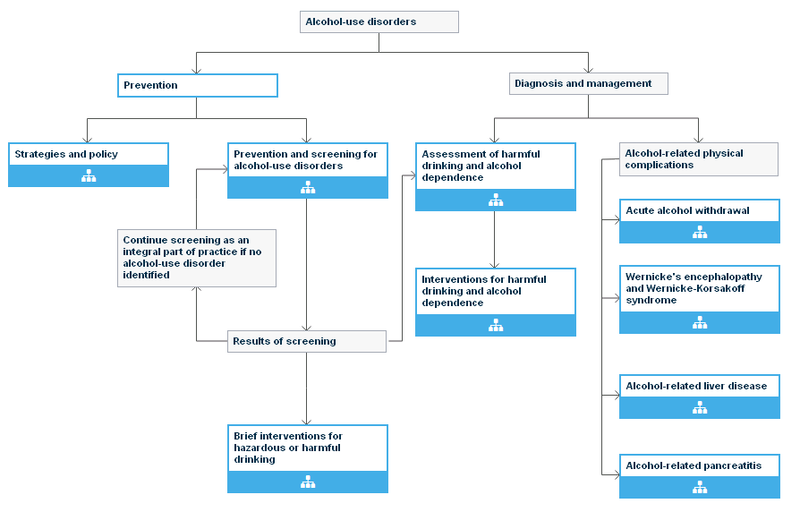 They are presented as flowcharts recommending decisions to undertake certain strategies and interventions depending on (in the case of the alcohol pathways) whether the objective is prevention or the treatment of alcohol use disorders, and in the case of treatment, on assessments of the patient’s condition. The pathways are interactive and designed to be used online. The starting flowchart ( diagram) includes boxes (blue in the diagram) which when clicked open up sub-flowcharts dealing with that set of interventions or strategies. School-based interventions on alcohol Recommends alcohol education should be integral to national science and personal, social and health education curricula, but schools should go beyond this to develop a ‘whole school’ approach working with relevant non-education services and authorities. Alcohol dependence and harmful alcohol use quality standard A concise statement of 13 practices which constitute high quality health care for problem drinkers and good practice in identifying and advising hazardous drinkers – standards which may be used to assess and reward providers and health service commissioning authorities.